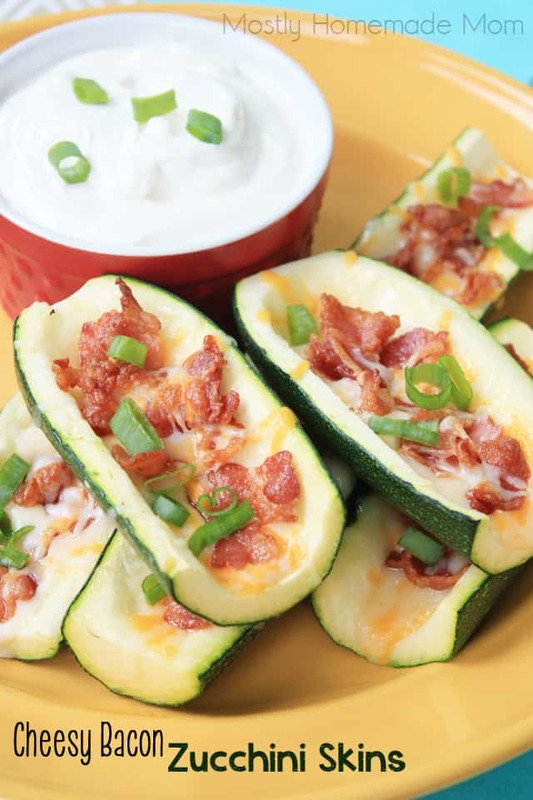 Use that over abundant backyard vegetable garden to make these Cheesy Bacon Zucchini Skins! 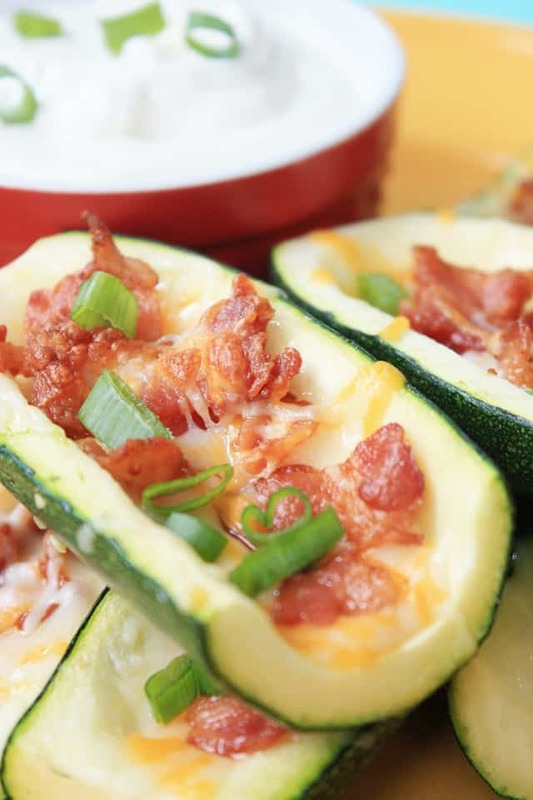 Loaded with Monterey Jack cheese, bacon, green onion, and dipped in sour cream – these are the low carb version of potato skins you’ve been looking for! Every year about this time I hear of these “rumored” zucchini plants in everyone’s gardens. 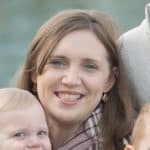 They apparently grow so easily and abundantly that you all search the web for lots of recipes to use them up. Not that I would know about that, or anything. I’m AWFUL at growing things, at least from seed. I’m okay for the most part starting with a small plant, but I have been known to kill those also. Pretty much the only two things I’ve ever been successful at growing, or more like maintaining, were cherry tomatoes and basil. So of course I was thrilled to be gifted pumpkin seeds in front of my kids by a local park, encouraging us that “now is the perfect time to plant pumpkins for fall!” Super cute summer learning activity, of course, kudos given from this former elementary teacher. But inside my heart sank a bit! 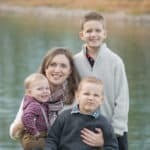 I let the news to them gently that we will try growing them, but that we’d probably buy our pumpkins this year like we do every year because Mommy does not have a green thumb of any kind. Wesley told me that it’s ok, he has a green thumb because he grew me a marigold for Mother’s Day from a seed. Hopefully he’ll rub off a bit on me with these! I WILL, however, enjoy the fruits (or vegetables, as the case may be) of your labor and cash in on the cheap zucchini at every supermarket and farmer’s market right now, as well as any friends decide to give to us. Zucchini all the things I say!! Who’s with me?! 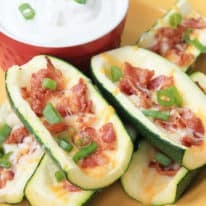 These Cheesy Bacon Zucchini Skins are AMAZING and they’re a great low carb alternative to everyone’s favorite potato skins appetizer. Dip these guys in sour cream or ranch dressing, the choice is up to you! 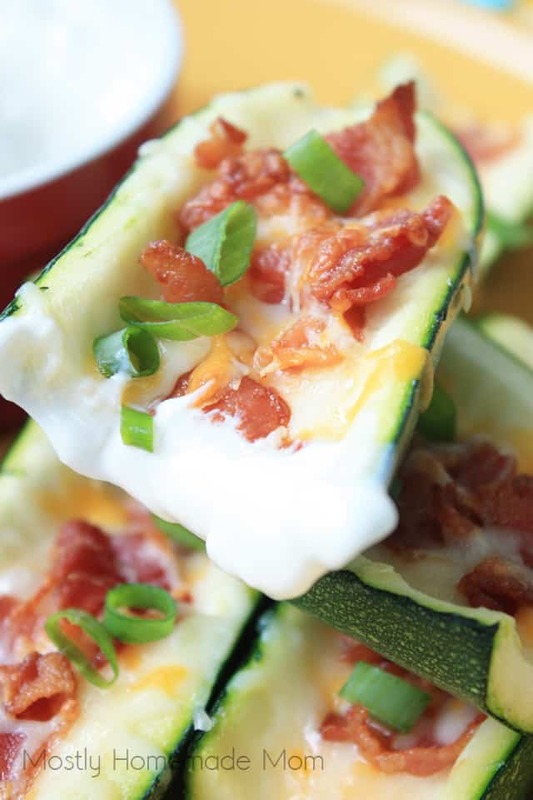 Cheesy Bacon Zucchini Skins loaded with Monterey Jack cheese, bacon, green onion, and dipped in sour cream - these are the low carb version of potato skins you've been looking for! Chop bacon and saute in a frying pan over medium heat until crispy, drain on paper towels. 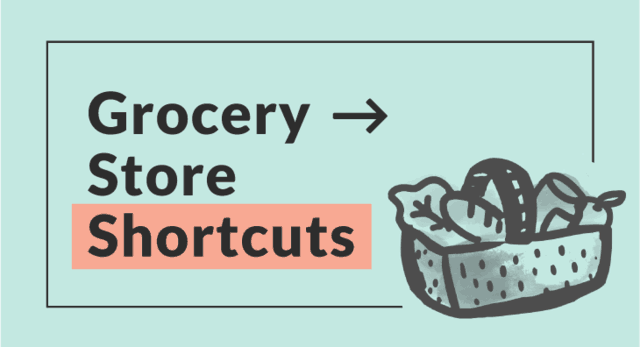 Slice zucchini in half length-wise. Cut in half and cut off the ends, creating 4 skins from each zucchini, 12 skins total. Using a large spoon, firmly scoop out the white part of the zucchini leaving about 1/4" inside the skins. Discard zucchini insides and place skins cut side up on a large cookie sheet. Sprinkle evenly with cheese and crumbled bacon. 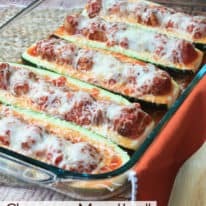 Bake at 400 degrees for 5 - 10 minutes or until cheese is done and zucchini is just slightly soft (they should still have a slight raw crunch to them). 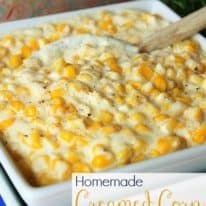 Allow to cool 5 minutes before topping with green onion and serving with sour cream or ranch dressing to dip. Paul and I LOVED these as a fresh, summer snack – but I could totally see making a larger batch and serving these guys for dinner. And of course, these would be perfect for summer parties and barbecues! 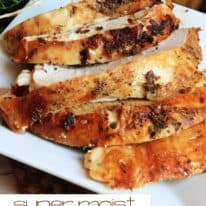 Having used Smithfield Hometown Original Bacon in the past and in this recipe, it’s definitely the bacon I grab regularly at the store – we usually go for bacon with classic scrambled eggs at least once each week. 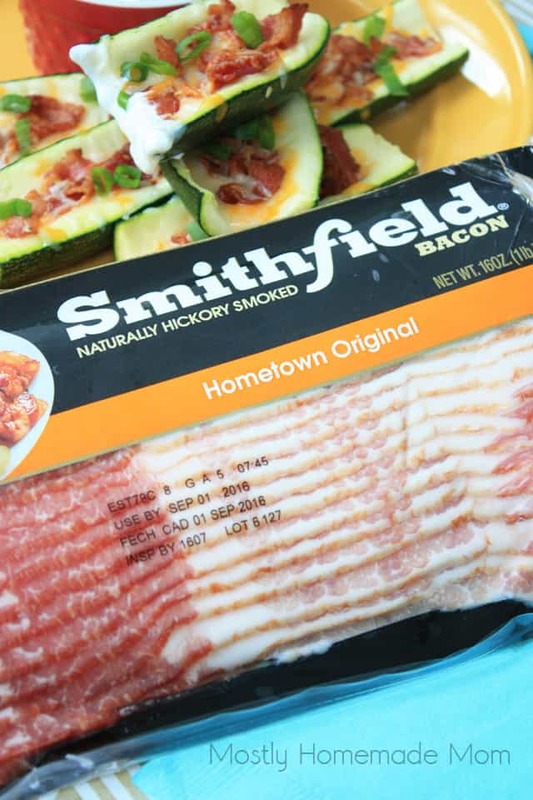 I really love their varieties available including Hometown Original, Thick Cut, Applewood, and Cherrywood because you can tell from the flavor why Smithfield is known for being smoked and cured to perfection. 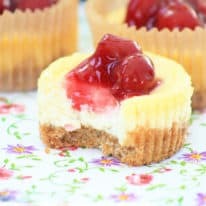 For even more yummy recipe ideas, visit Smithfield.com or Facebook.com/CookingwithSmithfield. 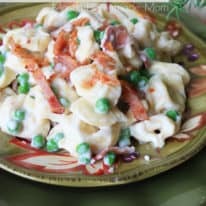 What’s your favorite summer recipe with bacon? Leave your inspiration in the comment section below!